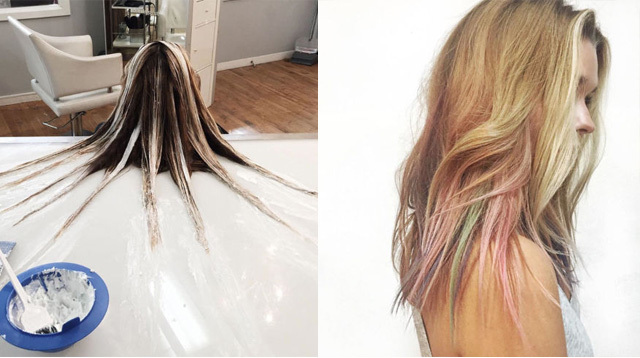 It's like balayage, but it's a technique called "fluid hair painting." You've probably heard of balayage (the super-popular highlighting technique in which the colorist paints dye or bleach freehand onto your hair for a natural, sun-kissed look), ​but does fluid hair painting ring a bell? Michigan-based hair colorist KL Christoffersen created the new technique, which is similar to balayage, where a colorist paints the color on you strands freehand while using a table for support. The table apparently makes the process a little more controlled, for a result that's just as gorgeous. If that sounds a little confusing, here's what the process looks like in action. The best part is that you can choose to do subtle, sun-kissed highlights or go super-bold with bright colors and pastels for more of a mermaid-looking balayage effect. Starting in December, Christoffersen is offering classes for colorists to learn her technique, so it's not too long before you'll be able to get it done at a salon near you.